In this blog post we concentrate on how to design a LED lighting package as a whole. And what different aspects you will have to take into account when selecting a light source and a driver. I decided to write this as a case example so that the post is more concrete. Most of the luminaire projects starts with the need for certain amount of lumen needed out from the luminaire. Then there can also be requirements for the shape and size for the light source. Color temperature, color rendering and lifetime expectancy might also be critical, but those are topics for a blog posts of their own. With these specifications, the finding of the suitable solution shouldn’t be a problem. Lumen output: Some of the lumens from the light source will be lost due to the optics. The amount of lost lumens is around 10%. Therefore, you should look for light sources that can give you at least 10% more lumens than you need. The shape of the light source. 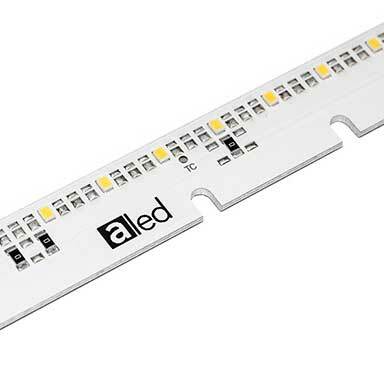 Do you have a minimum size for the light emitting surface? The luminaire in this example can be built with modules around 30cm in length, but that would probably not be perfect fit your luminaire. It would leave a lot of empty space and the light distribution wouldn’t be even. With those two in mind, you would need a light source that gives you roughly 2200lm and fills the whole 120cm evenly. That could be reached with for example 4 modules with lumen output of 550lm and length of 30cm or with two modules with 1000lm output and length of 60cm. For the case study presented above, you still have one more step to go: choosing a LED driver. Esko already wrote a good guide on this, so I’m going to be brief. Before we can start, you have to specify one thing: How many LED modules do you want to drive with one LED driver? Only one module or several modules in series? Check the current that you want to drive your light source(or sources) with. Check the voltage of your light source (or sources) and check that it fits the driver’s voltage range. You should always leave some room for the voltage as there might be some variations in the diodes. Check that the driver has around 10% lower minimum voltage and 10% higher maximum voltage than your light source. So there you have it in brief. If you need more help or would like to leave a comment, please leave a comment or contact me! You can also use our free tool to build your luminaire. This entry was posted in aLED, Drivers, LED, Uncategorized and tagged aLED, BAG, Citizen, Drivers, ELT, GE, LED modules, ROAL on 10.04.2015 by Tero Nurmi.